Blessed to be part of 100 Most Influential Filipinos in the Gulf once again. To God be the glory! The commitment to change lives one blog post at a time remains so strong. To all who've been part of Boy Dubai (you know who you are), thank you very much! Ion is amongst the most prolific and truly relevant Filipino bloggers in UAE. As Boy Dubai, he is able to write about his experiences, share his most powerful life principles, and be the voice of many overseas Filipinos. In the OFW community, Ion covers the untapped areas he believes will inspire and empower his fellow expats to look at life abroad a little lighter. Most of the subjects he covers reflects happiness and fun in mostly simple ways. 2016 has been a transformative year for Ion. He has been able to evolve his platform from a mere lifestyle blog into a true bastion of Filipino empowerment, covering topics that both inspire and challenge in an approachable, relatable manner. He believes that Filipinos can do far more than just eat out or go places to cope up homesickness. Ion convinces his readers to live and enjoy the present while still planning for the future. Understanding the full scale of his responsibility as a mass communicator, Ion operates under the principle that if something is to go viral, it should be positively influential. He ensures that his material is proactive and has a positive social impact to the readers and their circles. Changing lives, changing mindsets through the spiritual perspective, one blog post at a time. 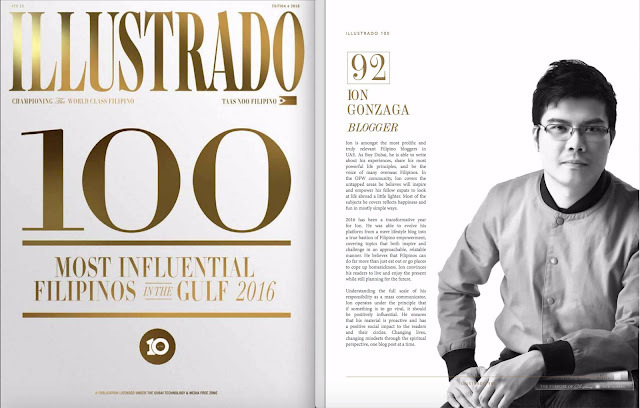 Kudos to Illustrado Magazine for consistently uplifting the community spirit! Mabuhay and sambayanang Filipino sa Gitnang Silangan!